Rinchen Khando Cheogyal was born in Tibet and has lived in exile since the 1960’s. 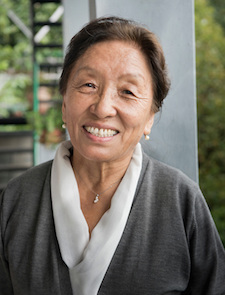 She has dedicated herself to the Tibetan cause and has traveled throughout the world, advocating the preservation of Tibetan culture. She has helped exiled Tibetans by focusing on education, improving conditions for the elderly and the poor, and in the development of religious studies for women. While president of the Tibetan Women's Association she founded the Tibetan Nuns Project which has built nunneries to provide education and take care of nuns who have escaped from Tibet. She also had two terms as the Minister of Education in the Exile Government. She is dedicated to giving practical help to the exiled-community and has a determination to do what she can in exile. As the Director of the Tibetan Nuns Project, she started the project when a group of 66 refugee nuns appeared overnight on the streets of Dharmsala, India. They had been on a two-year pilgrimage from eastern Tibet that ended in a journey over the Himalayas. Ill and exhausted, they had nowhere to go. The Tibetan Women’s Association organized emergency assistance to provide for their basic needs and the Nuns Project became active in finding a long-term solution to the problem of how to secure housing, medical care and most importantly, education for the refugee nuns. The Project created a sponsorship program, reaching out to individuals around the world.